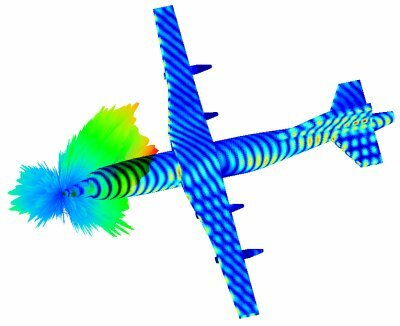 Monostatic and bistatic radar cross section of an arbitrary shaped perfect electric conducting body or a body with specific dielectric constant, permeability, and finite conductivity can be analyzed using our CAE software SINGULA . Closed or open surfaces of finite impedance and dielectric coated surfaces can be included in RCS calculations. A composite body with different material properties can be handled in SINGULA. For the problems of Radar Cross Section (scattering problems or open region problems), the integral equation method has more advantages than the FEM or FDTD methods, especially for electrically large structures. SINGULA uses the Fast Fourier Transform (FFT) technique to speed up the matrix-vector product, which can overcome the weaknesses of the FEM method when dealing with highly lossy materials.